10 Human Food That Are Safe for Dogs! As a responsible and informed dog lover, you probably know that too much human food is not safe for your dog. Or can cause unnecessary weight gain. There are many types of human food that can be safely added to your dog’s meals to give a nutritional boost and add variety. Below are just ten human foods that are safe and beneficial for dogs. Flax seed (ground or oil) is a good source of omega-3 fatty acids, which are essential fatty acids that are good for skin and coat. Flax seed can also be added to your dog’s diet as a source of fiber. Flax oil is a more concentrated form of omega- 3 fatty acids without the fiber. Salmon is a fatty fish which is also a good source of omega- 3 fatty acids. These fats support the immune system and can be beneficial for skin and coat health. There has also been some indication that they may benefit dogs with allergies. You can feed salmon or salmon oil. If feeding salmon, make sure it’s cooked before serving. If your dog requires extra protein in his diet, cooked, unseasoned chicken is an easy addition to his regular food. It also makes a good meal replacement if you’re out of dog food. Pumpkin and sweet potatoes are very good sources of fiber and help digestion. Sweet potatoes contain vitamin B6, vitamin C, beta carotene, and manganese. Sweet potatoes are great sliced and dehydrated as a chewy treat for your dog. Green beans are a good source of plant fiber, vitamin K, vitamin C, and manganese. If your dog has a tendency to put on weight, then replacing some of her regular food with green beans is a great low calorie way to fill her up and help her maintain a healthy weight. Many dogs enjoy green beans frozen. Carrots are low in calories and high in fiber and vitamins. 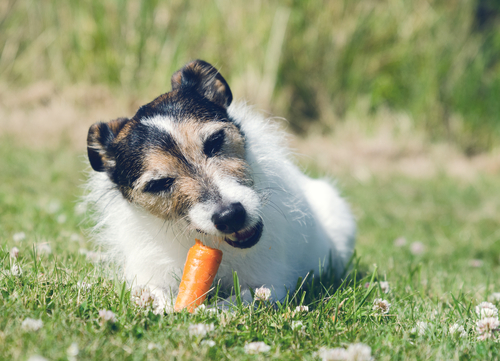 Plus, crunching on carrots can be good for dogs’ teeth. Eggs are a great source of very digestible protein, riboflavin, and selenium. For some dogs that are prone to digestive upset, eggs can give them a little protein boost. 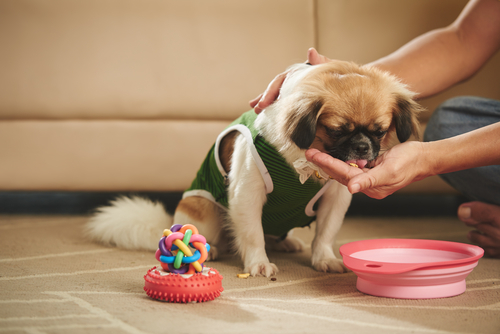 Adding eggs to your dog’s food is a healthy treat. Make sure to use cooked whole egg, as raw egg whites can cause biotin deficiency..
Apples are wonderful crunchy treats for your dog. Apples with the skin on are full of plant chemicals (phytonutrients) that are thought to be protective against some types of cancer in humans. They are a source of vitamins A and C and fiber. 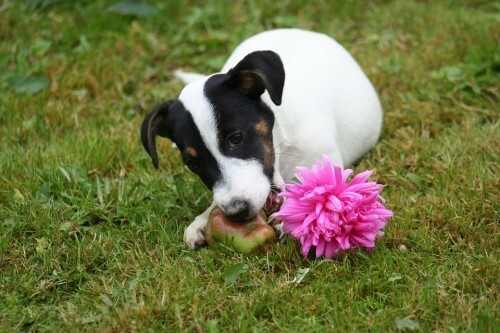 Apple seeds, however, contain cyanide so your dog should not be allowed to eat the core. Oatmeal is another source of good fiber. 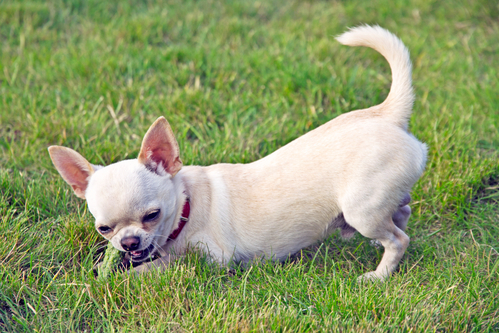 This can be beneficial for some older dogs that may have trouble maintaining bowel regularity. Oatmeal is also an alternative source of grain for dogs that are allergic to wheat. It can be fed in conjunction with probiotics to enhance their function. Keep in mind oatmeal should always be fed cooked and plain with no sugar or flavoring. As always, check with your veterinarian before making any major changes to your dog’s diet. 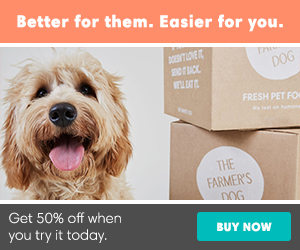 The suggestions above are not meant to replace your dog’s normal, balanced diet. Rather, they are ideas for alternative treats or for adding a little variety to your dog’s meals. Did you know that onions are dangerous for dogs: Read here to find out why. Maybe you are thinking of transitioning to a raw food diet, here are some tips to help: Transitioning your dog of puppy to a raw food diet. Have a cat? : You ‘ll want to read which human food is dangerous to cats.